I love Naibai, I could eat it every single day. I also love its deep green hue which seems to whisper to me that it is full of healthy stuff that will make my hair grow long and shiny and contribute a glow to my skin. I love everything about it, and here I am going to share a quick recipe on how to make Naibai yummy as hell! This is a really simple way to cook Nai Bai - simply blanch it in water, cook up some crispy fried chopped garlic and throw that garlic on top of the blanched Nai Bai together with a easy-peasy oyster-sauce-sugar-water mixture. Voila! Delicious and nutritious. Set a pot of water on the boil. While that is on the stove, heat up a small pan with vegetable oil. When the oil is hot, turn the fire to low, and add the diced garlic. Gently stir the garlic pieces around in the oil to help it cook more evenly, and also to prevent it from burning. When the garlic starts to take on a light brown colour, turn the fire off but let the garlic sit in the hot oil to continue cooking until it darkens just a little more, then take it off the stove immediately and pour into a small bowl. Now we shall blanch the Nai Bai. Prep the Nai Bai by washing it thoroughly and slicing a thin layer off the stalks. Slice each head of Nai Bai into half. Throw them into the boiling water and let the Nai Bai blanch for a couple of minutes or until the stalks have turned slightly transparent. When done, take the Nai Bai out of the water and arrange on a plate. Using a pair of chopsticks, gently hold them down as you drain the plate of additional water. In a separate small bowl, mix the oyster sauce, sugar and hot water together to create a sauce and pour this sauce over the Nai Bai. Finally, spoon out the crispy fried garlic onto the Nai Bai over the oyster sauce. Does it look good? Well, dig in quickly because it tastes as good as it looks. 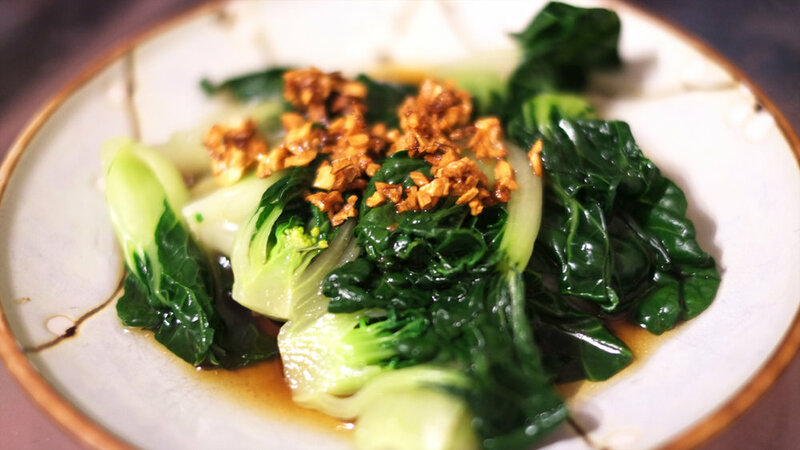 Nutritious and Delicious Nai Bai cooked in a simple sauce will leave you falling in love with this leafy green! Set a pot of water on the boil. While that is on the stove, heat up a small pan with vegetable oil. When the oil is hot, turn the fire to low, and add the diced garlic. Gently stir the garlic pieces around in the oil to help it cook more evenly, and also to prevent it from burning. When the garlic starts to take on a light brown colour, turn the fire off but let the garlic sit in the hot oil to continue cooking until it darkens just a <em>little</em> more, then take it off the stove immediately and pour into a small bowl. Prep the Nai Bai by washing it thoroughly and slicing a thin layer off the stalks. Slice each head of Nai Bai into half. Throw them into the boiling water and let the Nai Bai blanch for a couple of minutes or until the stalks have turned slightly transparent. When done, take the Nai Bai out of the water and arrange on a plate. Using a pair of chopsticks, gently hold them down as you drain the plate of additional water. In a separate small bowl, mix the oyster sauce, sugar and hot water together to create a sauce and pour this sauce over the Nai Bai. Finally, spoon out the crispy fried garlic onto the Nai Bai over the oyster sauce.